Robert George Alfred Houghton married Sarah Amy Baker. Mary Laurena Houghton married Moses Herbert West in 1913. Ellen Amelia Louisa Houghton married Whit Jessop in 1920. Lois Jane Blanche Houghton married Henry Harvey in 1920. Jean Dalziell Thompson married Rev. Samuel Gaffey Houghton, son of Alfred Houghton and Ellen Meher, in Jul 2, 1907 at Pittstown, PA, USA, age 27 and 25. 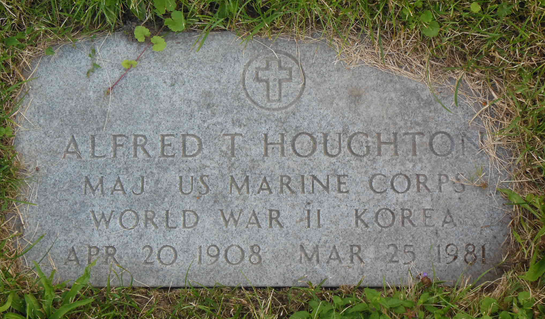 Alfred Thompson Houghton married Elvah French in 1931. Bruce Alfred Houghton married Cheryl A. Carlstrom in circa 1965. Burial Cathedral Cemetery, Wilmington, New Castle Co., DE, USA, Comp. A., 4th DE Inf. Burial possibly Tomb 15--Hooten & Watts Family Tomb (13). Evidence indicates the body may have been moved to Mt. Auburn, Cambridge.